Boaters float past huge Steamboat Rock, which sits at the confluence of the Yampa and Green Rivers in northeastern Utah. For three months in spring and summer, the Yampa River‘s waters run high with Rocky Mountain snowmelt, then surge through Class III and IV rapids. If navigating the last undammed tributary of the Colorado sounds challenging, it is. But on an OARS trip, you raft the river and then some. Day one is spent on a gentle stretch after the put-in at Deerlodge Park, where within a mile, canyon walls jut up to 1,000 feet (300 meters). On day two, groups graduate to paddling riffles, and by day three rafters are ready for Warm Springs Rapid—the Yampa’s big water—where more timid youngsters have the option of walking around the rager. Aside from the froth, the trip’s also got sandy beaches for perfect riverside campsites. At Harding Hole, you’ll set up your tent on the sand where the walls come closest to the river, jutting straight up from your site. There are also unrivaled yellow- and red-rock canyons, and patient guides: “Most of our guides are in their 20s and 30s, so they still remember what it’s like to be kids on the river,” says OARS founder George Wendt. 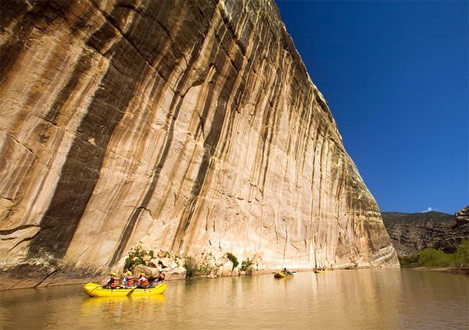 The 72-mile (116-kilometer) float goes through Dinosaur National Monument, which contains one of the world’s largest concentrations of fossilized remains encased in river rock. Pull off the river to check out petroglyphs and Fremont Indian ruins or climb to the top of the Anderson Canyon for otherworldly park views. Cool off with a brisk dip when you float into camp, then sit back in folding camp chairs for hors d’oeuvres while guides cook up salmon and corn on the cob. After soaking up a long, full day of the jaw-dropping geology, hang fireside with a river-chilled beer (the trip is BYOB) while kids play horseshoes or go on a nature hike with guides.